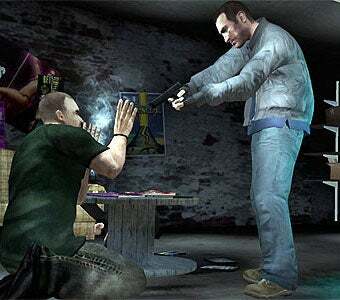 Grand Theft Auto, often the whipping-boy for the anti-violent video games movement, is being used by a program in Merseyside, England to help stop children becoming desensitized to violence. Welcome to Bizarro world. Whenever the subject of violent video games arises, Rockstar's Grand Theft Auto franchise seems to be the go-to example of a game that can seriously harm children playing it, altering their brain meats until they are seething masses of aggression and hate - and I'm only exaggerating slightly here. So excuse me if the fact that the Get Real project in Merseyside is using images from the series to help teach children the harsh reality of swinging about stabbing or shooting people. The program, backed by a £15,000, is the result of collaboration between the Merseyside branch of Support After Murder and Manslaughter and the Merseyside Police. Images from Grand Theft Auto, along with The Simpsons' Itchy and Scratchy and Bugs Bunny cartoons, are placed on a series of cards, which educators use to provoke discussions on the real consequences of violent actions. While some parents objected to the display of images from Grand Theft Auto to primary school children, Support After Murder and Manslaughter branch chairman Gaynor Bell explains there are methods behind this madness. "They (children) see violence so often in their daily lives that they are desensitized to it and cannot really appreciate the consequences of picking up a hatchet and swinging it around. This is all about showing them that if they put a knife in someone, that person will die and they will end up in jail. It is getting the message over to them about what's real and what isn't." And Mrs. Gaynor certainly knows the difference, having set up the group after one of her sons was stabbed to death and another was killed after being hit by a car. "The kids these days are just getting worse and worse and I blame the mums and dads. They just don't teach their kids respect any more. They don't teach them what's right and what's wrong which is exactly what we're trying to do with this programme." These are sentiments I've personally echoed time and time again, so I certainly feel this endeavor is a noble one. Margaret Morrissey, from campaign group Parents Outloud, said it was "inappropriate' to show certain images in primary schools as many parents had been "conscious not to allow their children to see these things and are trying to protect them until they are old enough to cope". I always figured that was one of the things parents did; helping their children cope with overwhelming things until they were old enough to handle it on their own. I didn't realize that children ripened like fruit on trees, and one day some sort of fantastical 'Cope Capable' meter would pop up, letting us know when they're done. Well that's certainly a load off my mind.